Overview - The house rips apart piece by piece. A bellowing cow spins through the air. Tractors fall like rain. A 15,000-pound gasoline tanker becomes an airborne bomb. A mile-wide, 300 miles-per-hour force of total devastation is coming at you: Twister is hitting home. In this adventure swirling with cliffhanging excitement and awesome special effects, Helen Hunt and Bill Paxton play scientists pursuing the most destructive weatherfront to sweep through mid-America's Tornado Alley in 50 years. By launching electronic sensors into the funnel, the storm chasers hope to obtain enough data to create an improved warning system. But to do so, they must intercept the twisters' deadly path. Before he reinvented himself as a director (with 2001’s overlooked horror gem ‘Frailty’) and a cable-television phenom (with HBO’s ‘Big Love’), actor Bill Paxton built his career on a string of character roles. Whether screaming “game over, man!” in ‘Aliens,’ flicking a knife at Schwarzenegger in ‘The Terminator,’ or yucking it up as a used car salesman in ‘True Lies,’ Paxton had a knack for nabbing minor roles in classic blockbusters. His transition into the spotlight began with 1996’s ‘Twister’ -- a critically defunct film from ‘Speed’ director Jan de Bont that pitted Paxton against a devastating tornado in Oklahoma. Bill Harding (Paxton) and his soon-to-be-ex-wife Jo (Helen Hunt) set aside their differences to help a team of “storm chasers” insert a device into a tornado that will reveal the secrets of other meteorological terrors. Their hope is that it will allow them to create the perfect early-warning technology to save people and predict the path of a tornado. However, they inadvertently stumble into a race with an opposing team of scientists who have more funding, better equipment, and a similar device. Taking advantage of a particularly dangerous storm system, the Harding team rushes to find and track an F5 tornado -- one of the most destructive classes of tornado in the natural world. Even if I didn’t already know ‘Twister’ had been an early summer blockbuster in 1996, I could’ve identified its big-dumb-fun actioner roots within the first fifteen minutes. The characters are paper thin, the actors are secondary to the CG wizardry of the tornadoes, and the sleazy scientists-in-black inject an unnecessary band of villains into the story. Admittedly, film fans who are able to suspend disbelief and shrug off faulty science will have a much easier time getting into ‘Twister’ and will likely find a lot to enjoy. There are some nasty plot holes to navigate, but a simple scan of the synopsis should clue newcomers into the fact that logic isn’t de Bont’s priority. ‘Twister’ is about slinging crazy amounts of destruction across the screen, recreating a horrifying force of nature, and pitting a helpless pair of ex-lovers against impossible odds. Screenwriters Michael Crichton and then wife Anne-Marie Martin don’t even attempt to disguise the romantic plot at the heart of the film. Like many filmmakers of summer extravaganzas from the mid-90s, they clearly assumed “man vs. nature” couldn’t possibly provide enough conflict or tension to fill a two-hour film, so a love story, a cautionary tale on career obsession, and a diatribe about funded science were all thrown into the mix. Honestly, the film bulges from an onslaught of subplots that just don’t matter. If the script were stronger, these elements could’ve been excellent additions, but the cookie-cutter screenplay makes it all feel extraneous in light of the actual stars of the film -- the tornadoes. 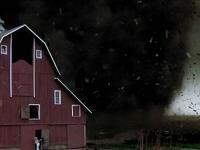 For all of its jabbering and flighty drama, ‘Twister’ is at its best when a tornado is plowing across the screen. If de Bont would have latched onto his CG-birthed disasters instead of the arguments and infighting of the film’s characters, the film would have been more consistently engaging. And what of Bill Paxton? Like the rest of the performers in ‘Twister’ (which includes a rare campy appearance by Philip Seymour Hoffman), Paxton simply has nothing to work with. The human drama is weak to say the least, offering very little substance to the overall arc of the story, and it fails to create three-dimensional characters that feel authentic. The cast obviously invested as much emotion into each scene as possible, but the dialogue just didn’t cut it. When the actors focus their attention on the film’s true adversaries, the tornadoes, everything clicks together, but when they’re pitted against each other, I simply wanted to fast forwarding to the next chase. It’s been more than ten years since ‘Twister’ leveled theaters and it still offers a lot of fun for disaster-flick junkies and fans of actioners from the mid-90s. Overall, the story is an overcrowded mess and the characters are cardboard cut-outs compared to the tornadoes themselves. I definitely didn’t despise ‘Twister’ circa 2008… I just didn’t love it as much as I did as a teenager in 1996. Along with 'P.S. 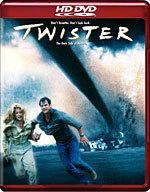 I Love You,' 'Twister' is one of the last HD DVDs being distributed by Warner Brothers in the US. Like all of their recent HD releases, this one features the same transfer as its Blu-ray counterpart. To cut to the chase, this 1080p/VC-1 transfer will satisfy fans and keep dissenters at a distance. The first thing I noticed was the clarity of the print -- remastered for its high-def debut, I didn’t catch any source noise, artifacting, edge enhancement, or print deficiencies. Scene to scene contrast is steady and the picture retains its filmic layer of grain without resorting to any messy post-processing effects like DNR. Details receives a healthy upgrade as well. Textures pop, hair and skin look fantastic in close-up shots, and tiny details like the flecked rust on Paxton’s truck add grit and personality to the set design that had I missed when watching the film on DVD. The palette does take an intentionally dismal turn in the second act, but colors remain bold and stable in spite of the overcast skies. Alas, everything isn’t as incredible as it may seem on first glance. Skin tones consistently flush and fluctuate, sometimes growing pink and pale in the course of the same scene. At times, the actors look as if they’ve been running in circles when they’re actually just sitting and having a conversation. A quick scan of the 2004 SE DVD reveals instances of the same issue, but it’s far more prevalent on the HD DVD version. It doesn't help that several shots seem flat or soft compared to my ideal expectations for the transfer. On a lesser note, delineation is also a bit problematic -- background details that were clear on the DVD are occasionally cloaked in heavier shadows. My assumption is that the heavier shadows are more faithful to the original theatrical print, but there’s no way to be sure. All in all, ‘Twister’ provides a solid catalog transfer that has a lot to offer fans of the film. It may not pack the same punch as other catalog releases on HD DVD, but it easily trumps every standard DVD on the market. ’Twister’ also offers the same, powerful Dolby TrueHD 5.1 surround track as its Blu-ray counterpart -- a mix that lives up to the sonic reputation of its highly-regarded DVD predecessor. Dynamics steal the show from the opening credits to the climactic ending and the LFE channel doesn’t just support the mix, it inhabits it. Rumbling thunder, roaring winds, and splintering wood sound perfect and will tear through your speakers with a vengeance. Likewise, the treble-pitched wheen of the high winds never sound shrill, artificial, or overwhelmed by the soundscape. The soundfield itself is spread throughout each channel, and ambiance is particularly impressive in spite of the bombastic nature of the film. Acoustics have been carefully reproduced and voices exhibit varying weights when a scene moves from the interior of a car to the wide expanse of a field. Best of all, pans are transparent, dialogue is clean, and directionality is spot on and eerily realistic. My only hesitation comes as a result of the track’s vocal prioritization. I recognize that many lines in the film are intentionally engulfed by the raging storms, but I noticed a few unintelligible lines elsewhere as well. Whispered words have a difficult time competing with the abundant ambience in the outdoor scenes, and there were several times where I was tempted to turn on the subtitle track. Of course, fans of the film will attest to the fact that this isn’t a new problem with ‘Twister’ -- the theatrical print and the DVD suffered at times from the same issue. Regardless, I’m confident audiophiles will be pleased to experience the aggression and the resonance of ‘Twister’s high-def release. The HD DVD edition of ‘Twister’ includes all of the supplements that are available on the new 2-disc Special Edition DVD. The content is surprisingly thorough and provides more than the previously-released single-disc Special Edition that most fans probably have on their shelves. My general complaint about the package is that all of the video features are presented in standard definition. Filmmakers’ Commentary -- Director Jan de Bont and visual effects supervisor Stefen Fangmeier discuss the production of ‘Twister’ in this four-year old commentary. The two are far too serious for my tastes (considering the tone of the film), but they offer quite a few nuggets of information about real tornados, liberties taken in the story, and the CG artisans who made a compelling villain out of wind. They also discuss casting, the on-set atmosphere, and the commitment the actors made to the then-uncommon effects process. All in all, fans might find more value in this rather technical track than casual viewers. Chasing the Storm: Twister Revisited (SD, 29 minutes) -- This newly produced retrospective featurette includes fresh interviews with Bill Paxton and de Bont. While it smacks of self-congratulatory nods like most modern EPKs, it makes a fantastic case for ‘Twister’s place in Hollywood history and the heyday of early CG. The fun of the production is revealed more clearly here than in the commentary and it was easy to see why everyone was so proud of their work. This is worth a watch for anyone who even remotely enjoyed the film. The Making of Twister (SD, 14 minutes) -- This production featurette is actually just an HBO “First Look” EPK that whizzes through the film with an obscene amount of film clips and surface-level details. While it does highlight other cast and crew members who don’t pop up in the rest of the supplements, they don’t offer any additional information that isn’t covered somewhere else. Anatomy of a Twister (SD, 9 minutes) -- The most bizarre quality of this quick featurette is how repetitive it feels. Condensing all of the information already garnered from the other supplements, this extended trailer does little to bolster the behind-the-scenes package. Nature Tech: Tornadoes (SD, 44 minutes) -- Even though ‘Twister’ isn’t featured in this History Channel documentary, it easily outclasses the other supplemental material as the most interesting extra on the disc. It explores the nature of tornadoes, their historical ravaging of towns and villages across the world, and the manner in which modern day science is helping to predict and combat such catastrophes. Humans Being (SD, 4 minutes) -- A music video for Van Halen’s song of the same name. 'Twister' has never been the mecca of natural-disaster flicks. More than ten years after its release, it offers some fond memories and fun chases, but it fails to establish any real bond with its audience. Regardless, fans will be pleased to find that this HD DVD makes the standard DVD irrelevant. It features an above-average video transfer, a powerful Dolby TrueHD audio track, and a generous collection of supplements. While I won't offer a whole-hearted recommendation, I will say this catalog release is worth a look if you're still in the market for HD DVDs.